Caerphilly Castle is special to me. Perhaps, it is because it was one of the first sights I saw when I first visited Wales back in 1987. 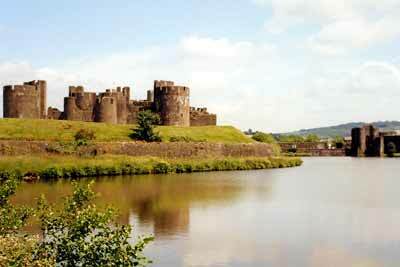 Caerphilly is a beautiful Welsh town not that far north from Cardiff. On the way to Portmeirion,which is located in northwest Wales, we stopped along the way to view the Carew Cross and the Pente Ifan burial chamber. Caerphilly Castle was built in the late 13th Century by the Anglo-Norman lord Gilbert de Clare to protect his land holdings from the Welsh. It was destroyed by the Welsh King Llewelyn ap Gruffudd in 1268 and rebuilt in 1270. 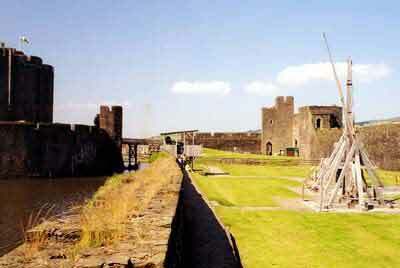 Caerphilly Castle utilized concentric walls within walls as a defense. This area had examples of medieval siege engines on the lawn area, with the outer wall to the right,the moat and then more walls to the left an example of the multiple lines of defense. Carew Cross,and the nearby castle,are located in the town of Carew, which is located in Dyfed,the peninsula which is the southwestern region of Wales. 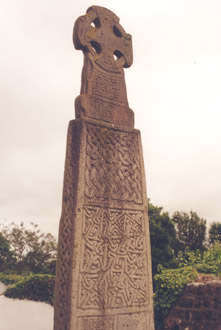 This cross commemorates Maredudd ap Edwin,King of Dyfed, who fell in battle in 1035 A.D.. 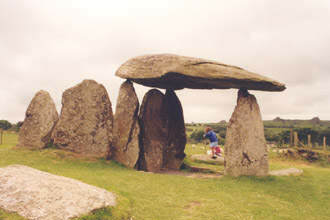 The Pente Ifan burial chamber is also in Dyfed. The ancient Kelts constructed this chamber over fifty-five hundred years ago.